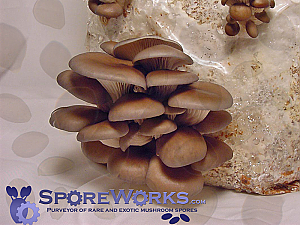 A large and adaptive edible species best suited for outdoor culture in the home garden. 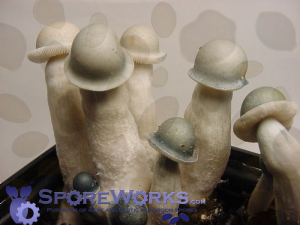 Indoor fruitings are possible but the King Stropharia requires an non-sterile casing to stimulate mushroom development and is slow fruit. 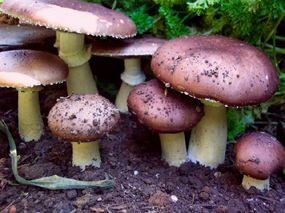 These difficulties are avoided by simply inoculating a garden compost pile. 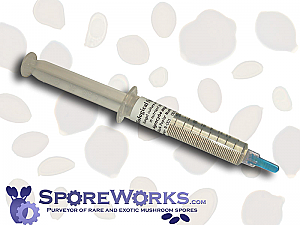 We have seen good results from a buried straw-based MycoBag(TM) colonized with King Stropharia mycelium via culture syringe injection. The fully colonized substrate block was removed from the bag and buried in spring under a lush patch of parsley. Many mushrooms fruited directly above the buried straw throughout the summer. We also noticed mushrooms in a nearby compost pile and last years potato patch. Large strands of mycelium are visibly spreading throughout the rich garden soil. The culture offered here is from a specimen collected in Cape Cod, Mass.